Have you ever been discouraged? That’s like asking, “Are you human?” Rare, if not non-existent, is the person who has never been discouraged. Why do we become discouraged? 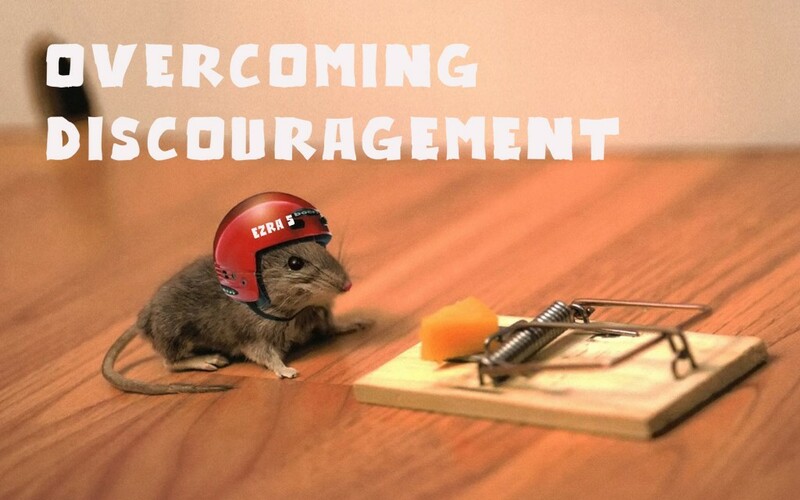 Sometimes discouragement stems from a physical cause. We are simply tired and worn out from working too long and too hard without a break. Or perhaps a bodily illness inclines us toward depression and discouragement. Another cause of discouragement is that we can be too idealistic. Coupled with idealism, discouragement often comes when people disappoint us. We were counting on someone who let us down. We had high hopes for a person who turned against us or failed spiritually and morally. It’s not hard to hear the discouragement in Paul’s lonely voice from prison, “Demas, having loved this present world, has deserted me and gone to Thessalonica” (2 Tim. 4:10). Disappointment with God is another cause of discouragement. You prayed and worked for something, but it did not happen. As far as you could tell, it would have been for God’s glory if it had come about, but it fell apart. You even had “claimed a promise” from the Bible as you prayed and worked, but from your perspective, God didn’t keep His promise. You begin to wonder whether you should ever try again to do anything for the Lord. People try to deal with spiritual discouragement in many wrong ways. Many plunge themselves into other things that they think will bring them fulfillment: entertainment, sports, travel, or their careers. Tragically, some turn to drugs or alcohol or adultery. All these things only dig them deeper in to discouragement. How could this dismal situation be reversed? How could the Lord’s people put their discouragement behind them so that they could finish the task of rebuilding the temple? To turn things around, the Lord raised up two prophets, Haggai and Zechariah,who spoke to the people in the name of the God of Israel (Ezra 5:1). Under the renewed leadership of Zerubbabel and Jeshua, the people began to rebuild and in spite of further opposition, the work was finished in a little over four years. Ezra 5 gives us four waysÂ to overcome discouragement in our work for the Lord. 1 Now Haggai the prophet and Zechariah the prophet, a descendant of Iddo, prophesied to the Jews in Judah and Jerusalem in the name of the God of Israel, who was over them. 2 Then Zerubbabel son of Shealtiel and Jeshua son of Jozadak set to work to rebuild the house of God in Jerusalem. And the prophets of God were with them, helping them. If you go back to Abraham’s or fast forward to the church explosion and expansion in Acts, all great efforts and advances of the kingdom begin with a word from the Lord. When we are discouraged, the thing that will most refresh us is to hear God speaking to us in our particular circumstances through His Word. I have often found that the passage a preacher reaches on a specific day has particular relevance to the very circumstances I am going through at that time. There are a number of ways that you can have a fresh encounter with God’s Word, but in every case, you must have exposure to that Word. In other words, it won’t happen if you never open your Bible or sit under the preaching of the Word. When you are discouraged, you may not feel like getting into the Word, but you must go against your feelings, if need be, and expose yourself to the Word. God speaks to us through His Word, and so you must take the time and effort to expose yourself to it. A. God’s Word confronts our sin. That is the main thrust of Haggai. He directly confronted the people with their sin of building their own houses while neglecting God’s house. God used him to stir up Zerubbabel, Jeshua, and the people so that “they came and worked on the house of the Lord of hosts, their God” (Hag. 1:14). You may be thinking, “When I’m discouraged, why would I want to be confronted with my sin? That doesn’t sound very encouraging!” It may not be pleasant at the moment, but it’s the medicine we all need. Sin destroys us and damages those who are close to us. To neglect the Bible because it confronts our sin is like avoiding the doctor when we know that we have cancer. It may not be pleasant to go through the treatment, but without it we will die. Scripture is profitable for reproof and correction (2 Tim. 3:16). B.Â God’s Word confirms His grace if we will repent. Those three names sum up the message of Zechariah: “Whom the Lord remembers, He blesses at the appointed time.” Although Zechariah was the prophet of hope and encouragement, he began his message by talking about God’s fierce wrath because of His people’s sin (Zech. 1:2). But immediately he follows it with the Lord’s gracious invitation, “`Return to Me,’ declares the Lord of hosts, `that I may return to you,’ says the Lord of hosts” (Zech. 1:3). If we will repent, God will be gracious to us. This is illustrated in our text: Ezra 5:1 is a new, new beginning. The first new beginning was in chapter 3, when the returned exiles gathered in Jerusalem, set up the altar, celebrated the Feast of Booths, and laid the foundation of the temple. Then the opposition discouraged and frightened them, resulting in 17 years of doing nothing about the temple. But now, we have a second new beginning. Thank God that He allows for new, new beginnings, and new,new, new beginnings! C. God’s Word reorients our priorities under His lordship. These two prophets spoke “in the name of the God of Israel, who was over them” (5:1), and Haggai exhorted them to get their priorities in order by putting God’s house first. Wherever we turn in God’s Word, it confronts our skewed priorities. We’re all prone to let the things of this world crowd the things of God out of first place in our lives. The Word keeps calling us back to the basic priority: â€œSeek first His kingdom and His righteousnessâ€ (Matt. 6:33). D. God’s Word shows us how to live in a manner pleasing to Him. But then the prophets spoke and the people realized that to please God, they needed to commit themselves to rebuild His temple. It’s easy to think that you’re doing okay in the Lord if you compare yourself to other Christians. We always seem to compare ourselves to those who aren’t quite as committed as we see ourselves! But then you come to God’s Word, and it exposes the thoughts and intentions of your heart! You realize that God wants purity in your thought life. He calls you to love Him with all your heart, soul, mind, and strength. You learn that Christ loves the church and gave Himself for her. But you don’t love His church like that! So the Word shows how we need to adjust our thinking, our priorities, and our behavior to please God. Discouragement had led the people to abandon work on the temple for 17 years. These prophets called them back to work. There is something encouraging about serving the Lord, especially if you’ve been on the sidelines for a while. There is the encouragement that He can even use me, in spite of my previous failures. One cause of discouragement is that we become self-focused. Often that self-focus generates self-pity and self-justification for why we quit serving the Lord. With Elijah, we begin to say, “I have been very zealous for the Lord,” but everyone else has “forsaken Your covenant, torn down Your altars and killed Your prophets …. I alone am left; and they seek my life, to take it away” (1 Kings 19:10). That kind of self-focus prevents us from seeing the needs of others and ministering to those needs. So the people after 17 years of stopping, begin to rebuild. Their lives are refocused on Him. No, sooner had the people begun to build than Tattenai, the governor over Israel, and his sidekick and their colleagues came and challenged them (5:3). â€œThe eye of their God was on the elders of the Jewsâ€ The eye of the enemy and the eye of God are continually upon us in all the work of life. Knowing that the eye of God is upon us, we can persevere even when the enemy is watching and trying to get us to quit. The letter shows that the Jews gave a strong testimony to Tattenai and his colleagues of God and His ways. The message that they send is that we have sinned before our God, but he is a God of mercy and we seek to worship that kind of God. But the point is, the Jews had given Tattenai and his colleagues a strong witness about God and His covenant faithfulness to His people. One way to persevere in the face of opposition is to give a strong witness of our faith in Jesus Christ. Knowing that others will be watching us, it adds to our commitment to Christ. If we will be bold for the Lord, we can know that His eye is upon us in whatever response our enemies come back with. To overcome discouragement, we need to trust the sovereign God to accomplish His will through us. God was sovereignly at work behind these events of the renewal of God’s people. The fact that this governor allowed the work on the temple to continue while an inquiry was sent to Darius was due to God’s eye on His people. In order to fulfill his purpose, God used and coordinated the preaching of the prophets, the work of the leaders, the determination of the whole community, and the decisions of the unbelieving government officials. It’s also obvious that the Jews saw God’s sovereign dealings with them in history, and this knowledge enabled them to put the current opposition in proper perspective. The Christian faith is tied to the fact that God made promises and fulfilled them in history, demonstrated by Jesus, who actually came, died, and rose again. Although God is sovereign, decisions we make do affect history.”As Paul exhorted, “Work out your salvation with fear and trembling; for it is God who is at work in you, both to will and to work for His good pleasure” (Phil. 2:12-13). We can know that as we work for the Lord, we are working in harmony with the sovereign God who is working out His purposes in history through His people. Rick Warren gives the following comments on discouragement: What does it take to discourage you?